A new month means a new beginning, to wipe the slate clean and to start fresh! 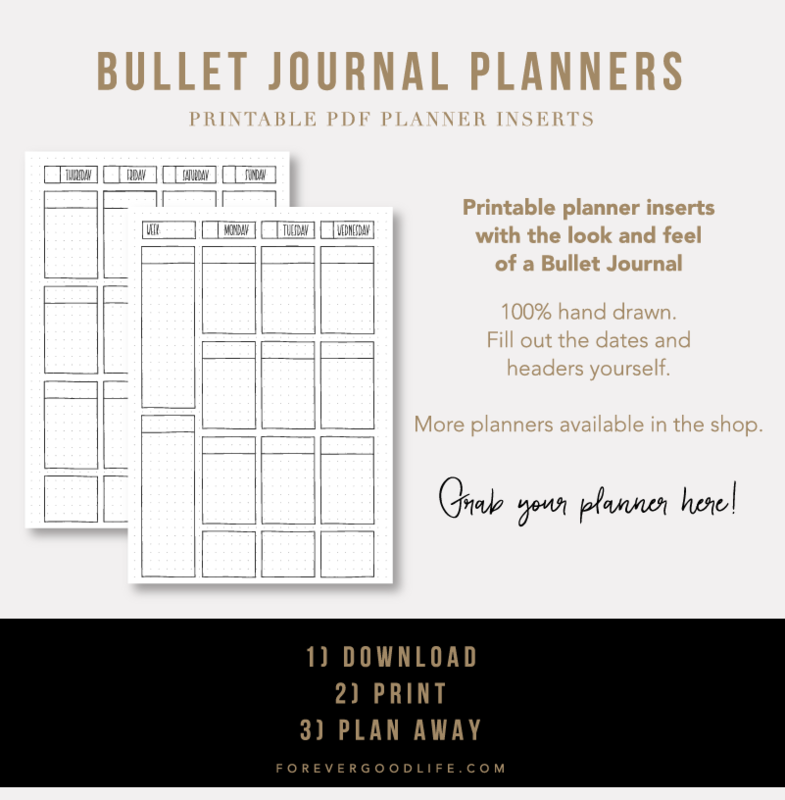 It also means it’s time to decide on next months goals + to set up the bullet journal. 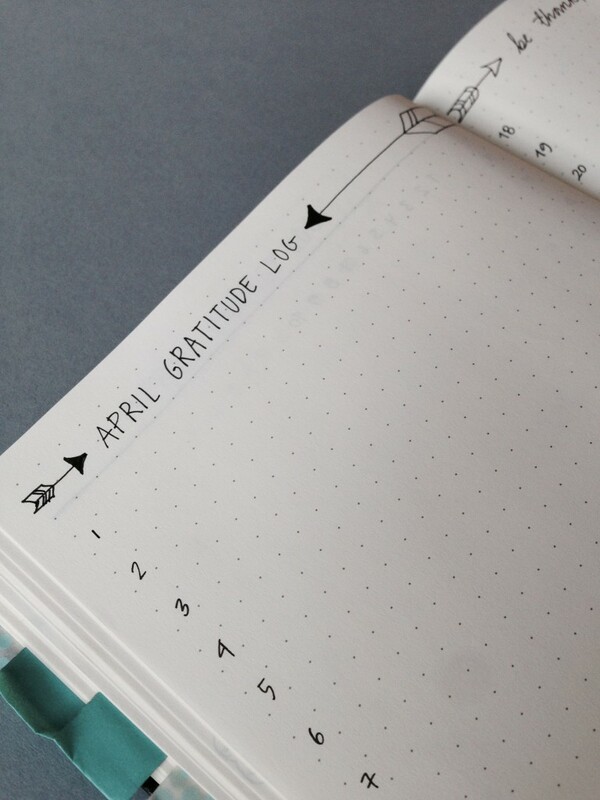 Here’s my BuJo set up for April. These are my “tried and true” collections at the moment. 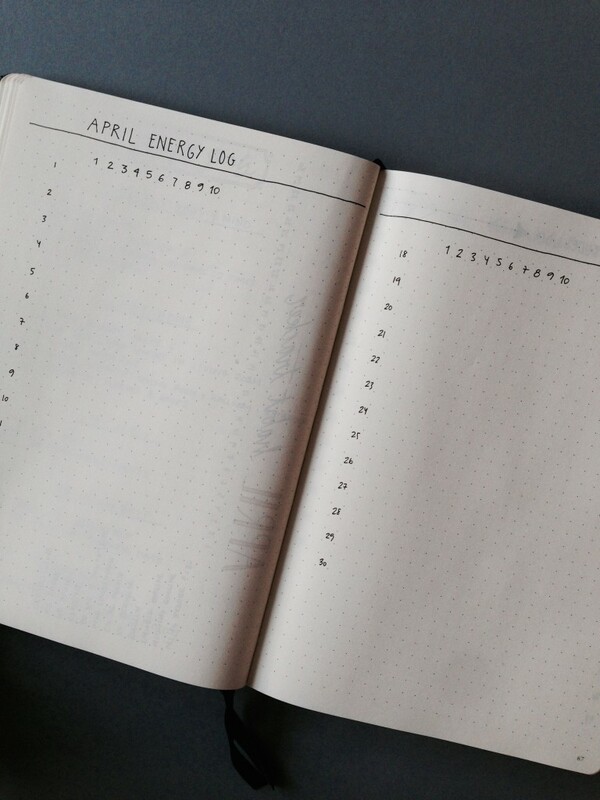 I decided to have my April Goals and my Habit Tracker on the same spread. That way I will look at my goals more often than I did this month and hopefully also make sure that I complete them. Let me share my process for setting my goals. Before I decide on any goals I read through my main goals list + the goals I had for last month. I want to make sure I keep my priorities right, which is why my main goal list is important. Also, I want to see if there are any goals that I want to tackle the coming month. I also check last months goals to see if there are any goals that I didn’t complete. In March there were quite a few that I didn’t complete and a few that I didn’t even start with. So, I have to decide if I want to migrate them to April or not. In this case I migrated some that I really want to get done. Just as an example, I decided to scrap the goal to work out twice a week as I failed miserably during March and I just don’t have the energy or willpower at the moment to make that happen. I hope I’ll get going during April but it won’t be the first week or two, and so I decided to not include it as a goal. Instead I decided to add the goal of walking or biking every day. That is more realistic and something that would really benefit me in so many ways. 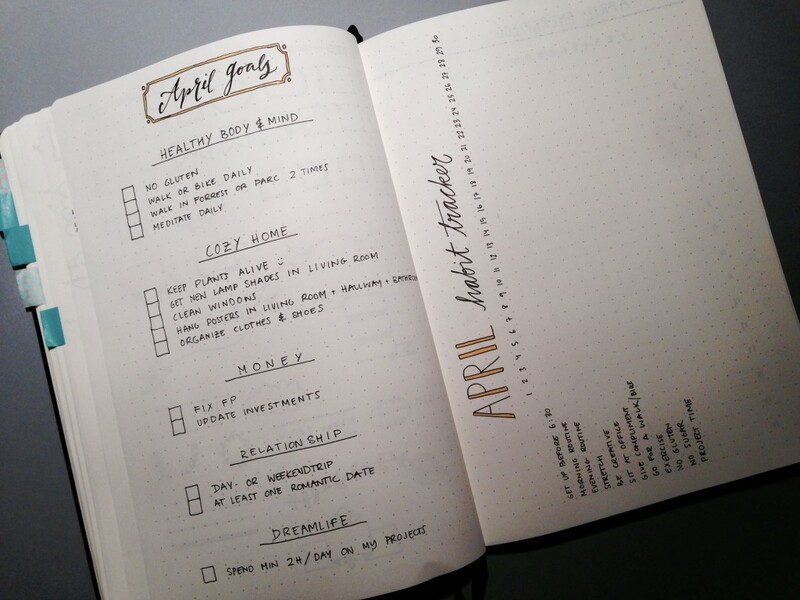 I like the idea of organizing my goals in different sections. This month I’m focusing on my health, home, money, relationship and moving towards my dream life. The goals are pretty self explanatory I think. 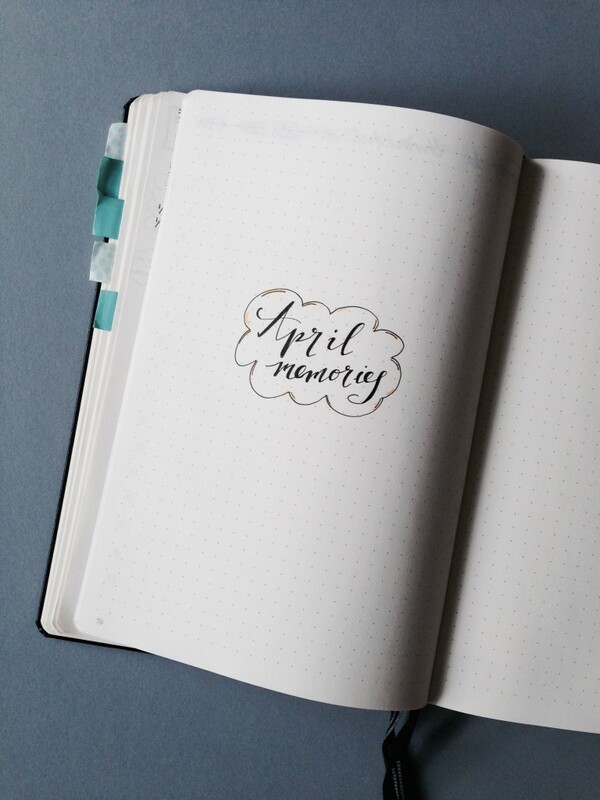 When it comes to the dream life section I will create a more detailed list of my goals for April in my new project bullet journal. 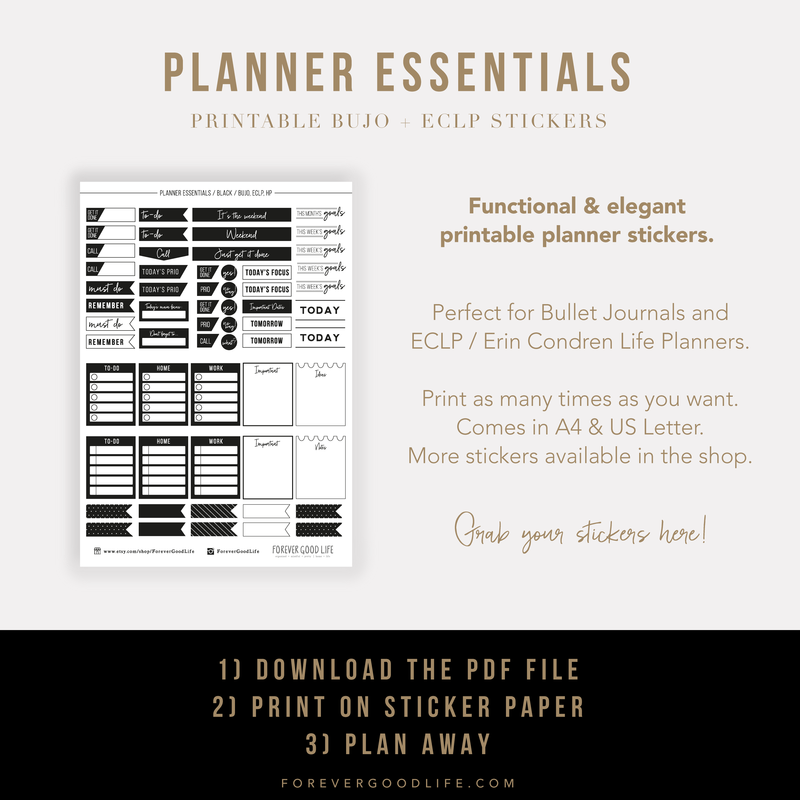 But I still want to have it as a goal in my personal bujo as it is a goal to spend at least two hours each day working on those tasks. There are some things that help me feel my best and to be the most productive. 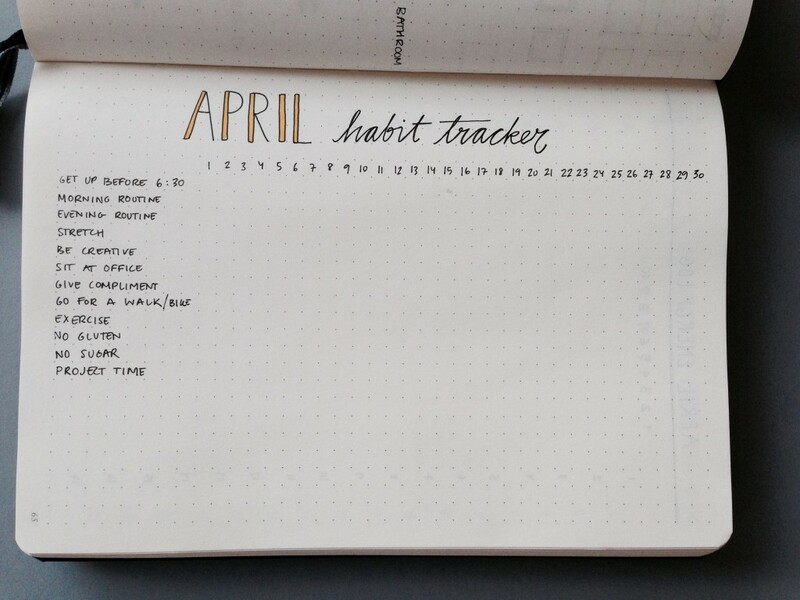 I make sure to gather those things in my habit tracker so that I 1) feel the pressure of wanting to mark it as checked and 2) notice when I slack. Some are directly connected with my goals, such as go for a walk/bike and project time (i.e. the two hours I want to spend each day moving towards my dream life). I truly believe that we can change our mindset and energy level to get more enjoyment out of life, to be happier and to have more life vitality. Brendon Burchard says “You don’t have good energy. You generate good energy” and that really resonates with me. 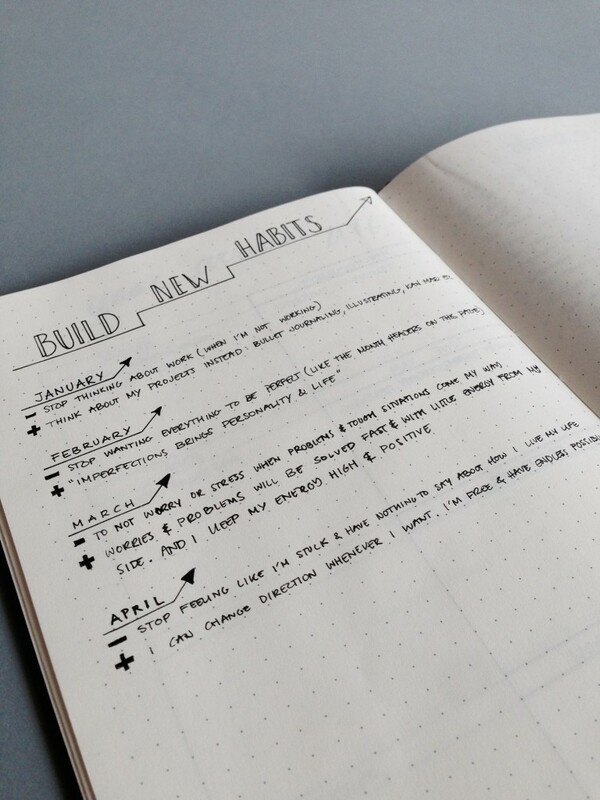 To help me with this I have two collections; Build New Habits (which really should have been named Build New Mindset) and Energy Log. Each month I take a mindset that I have but feel is draining me of energy and I flip it. I write down the energy draining thought that I have and then I write down what I want to focus on instead or a mantra I’ll repeat every time I think the negative thought. This is something I’ve done for a long time, but it feels really good to write it down and to focus on it for a whole month. It really does get engrained into my mind and I feel so much better. Of course I will still slack from time to time but it helps me get back on track fast whenever I slip. 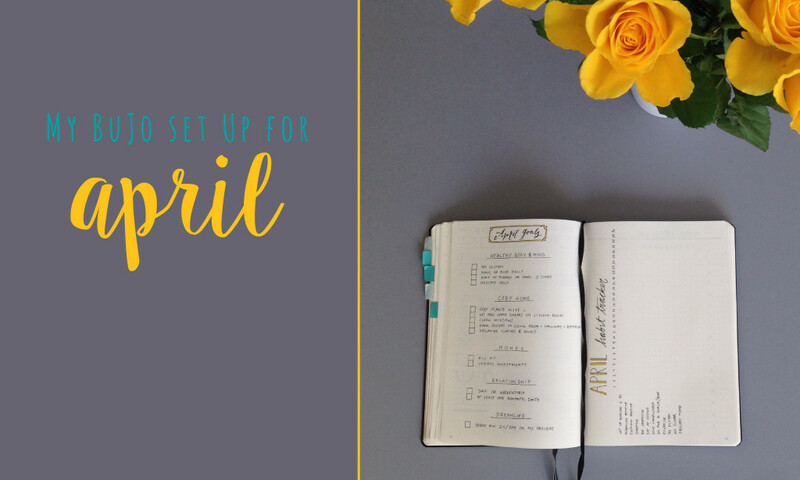 For April it’s a major mindset shift I want to make, and it is a thought (or rather a feeling) I get from time to time. It has taken me quite some time to first of all realize what it is as my “symptoms” aren’t directly related to the reason. They are more like I feel super low energy, I might feel sad for no apparent reason or I might get super easily irritated over small stuff. So for April my mantra will be something like “I can change direction whenever I want. I am free and have endless possibilities”. Just to remind myself that I am not stuck and I can change direction whenever I want to. As I said in the previous section, I really do believe that we can influence our energy levels ourselves. Energy is something that we create. I don’t think that it is necessary to keep track of our energy levels to be able to improve, but I thought it would be interesting to see where my energy is at. So I created this Energy Log collection. Twice a day (morning and evening) I try to assess where my energy level is at on a scale from 1 to 10. 1 being I’m in a deep funk and 10 being I’m on top of the world. My aspiration is to only have days that are 8 or above. Since I was a kid I’ve been thinking about things that I am grateful for. I wouldn’t write them down, it was just something that would spring to mind a few times a day. 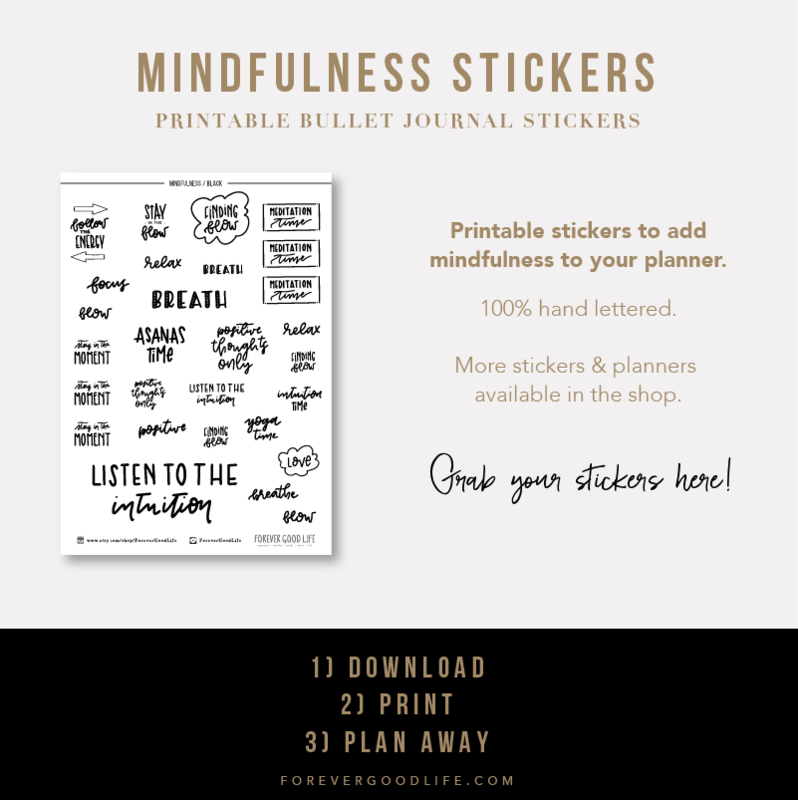 A few years back I started writing a gratitude journal as I read an article that it was better to write it down than to just think about it. But I only wrote in that journal for a few weeks. I still kept thinking the thoughts after that though. When I started with my bullet journal I saw that many had this gratitude collection so I decided to give it a try again. So far it’s been working ok for me as it is part of my morning and evening routine. And I decided to keep going with it in April as well. Ahh, I love this idea so much! This is where I’ll be writing and doodling things that happen during April that I want to remember. Most of the time it’s just small things that I do or that happen, but I like the idea of enjoying the small things in life as well as the bigger ones. What collections do you keep going back to month after month? 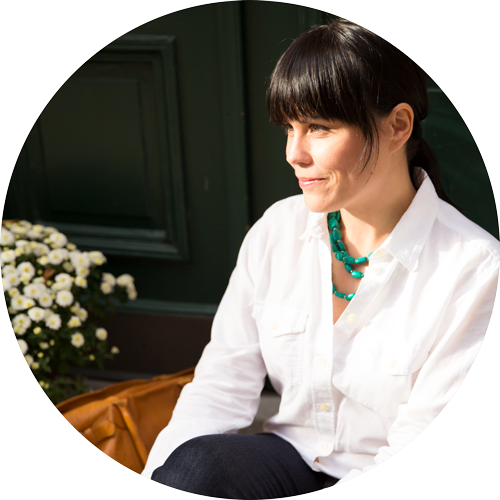 Hi Marta, thanks for your question! So what I’m doing is rating my energy level twice a day. First in the morning when I do my morning routine. Then in the evening I reflect back on the afternoon and evening and rate how my energy level was. 1 means I had super low energy, 10 means it was through the roof. If I feel like just any other day, not great but not low either, then I set that as a 5. And then I mark that in my tracker where each square represents one level. So if I felt like level 5 in the morning then I’ll mark five squares on the first row for that date. When I have a level 8, that means I’ve had great energy and that’s a level that I should be able to reach daily. 9 and 10 are for, you know, those days when you feel like superwoman. Those days that doesn’t come around that often (sadly).